(Click for a larger version.) I didn’t make it, and I have no idea where I got it from (do you know?). But in any case, wherever it comes from, I think it’s a really great puzzle. I did find the number that can make it through the diagram, but I never did completely finish proving that the solution is unique. Can you solve it? Let’s see if we can prove it together. Please don’t post the number in the comments. But please do post proofs that certain combinations of nodes are impossible. For example, you might post a proof that no triangular number can be one more than a prime; that would mean the leftmost path is impossible. This entry was posted in arithmetic, challenges, number theory, proof, puzzles and tagged cube, perfect, prime, puzzle, route, square, triangular. Bookmark the permalink. I shall make a computer program that does this for me. Sometimes, computer programmers do not use brains, and instead uses brute force. Let us know when your program finishes testing all nonnegative integers. We’ll wait. I can prove that there’s no other solution going down the right hand side. Let be a prime power with . Then a number less than is coprime to iff it doesn’t divide by . Every th number divides by , so there are such numbers. This is clearly not a prime power unless or . In neither of these cases can be an odd square. Hmm, good point, it’s a bit ambiguous. I think the intention is that there are zero numbers less than 1 which are coprime to 1, and 0 is not a prime power. I guess we should take “positive integer” as the definition of “number” for the purposes of this puzzle. So far I got: No number can be 4 more than a square and also a odd square number. This is because there has to be two squares that differ by 4 which is impossible. The smallest square numbers are 0, 1, 4, 9, 16 and none of them differ by 4. I can prove that we can’t go down the left hand side after. The triangle number divides by when is of the form or . 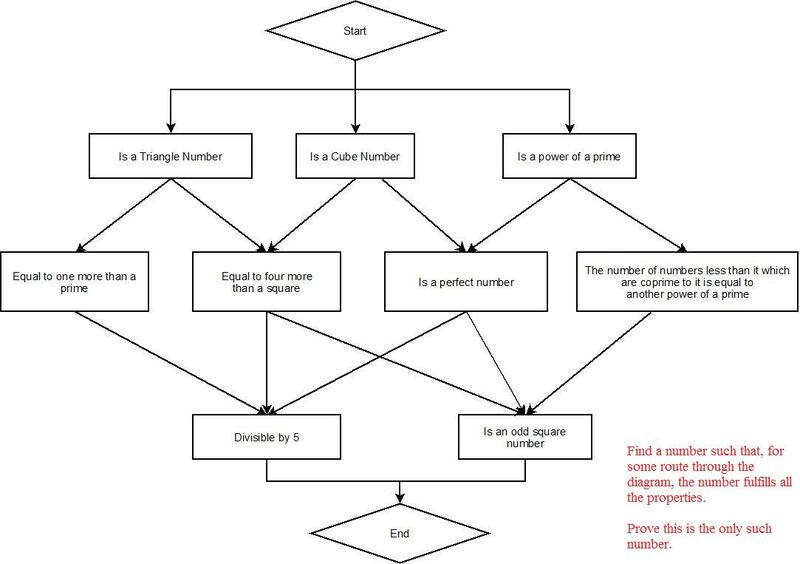 Hence if our triangle number is one more than a prime then the prime is of the form or . These factor as and . These numbers have two factors each greater than , so even when we divide by the they wont be prime.